Mercury reflector lamps are gneerally manufactured in outer envelopes having a parabolic form, with the arc tube located close to the focal point, so as to project a relatively narrow beam of high luminous intensity. That may be desirable for industrial and commercial applications where the unformity of illuminance on the working plane takes second priority to efficiency, however in greenhouse lighting for the stimulation of plant growth, efficacy is less important and uniformity of illuminance takes priority. 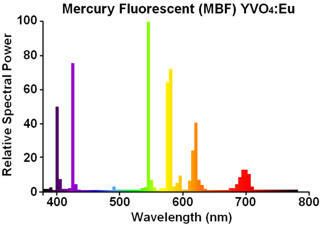 Otherwise when using conventional mercury lamps, plants grow more rapidly directly under the lamps than in between, and the differing rates of growth are troublesome to manage. This lamp therefore employs an ellipsoidal shaped reflector, which projects a beam of considerably greater angle without the hot-spot directly below the lamp, and as a result greater uniformity on the working plane. 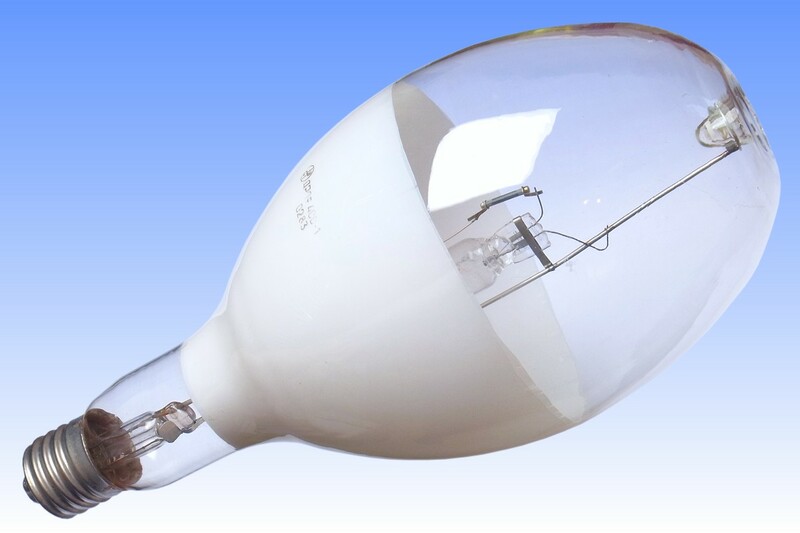 In order to avoid the need for developing a special new bulb shape, a standard ellipsoidal bulb from an ordinary high pressure mercury lamp has been employed, but the arc tube is located closer to the bulb neck, closer to the focus of the reflector. 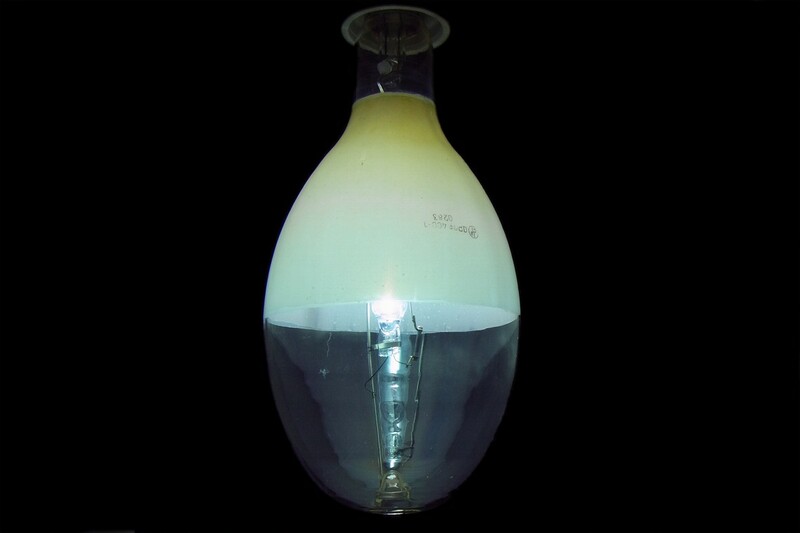 The 'reflector' part of the bulb is coated with a light reflective layer of titanium dioxide powder, and overcoated with yttrium vanadate phosphor to provide some colour correction. This 400W lamp employs the larger bulb normally used with 700W ratings, in order to increase the reflective surface area for improved optical efficiency. Such lamps were popular for horticultural applications until the mid 1980s, when they began to be replaced by high pressure sodium lamps whose spectral power distribution is better matched to the photosynthetic action spectrum. 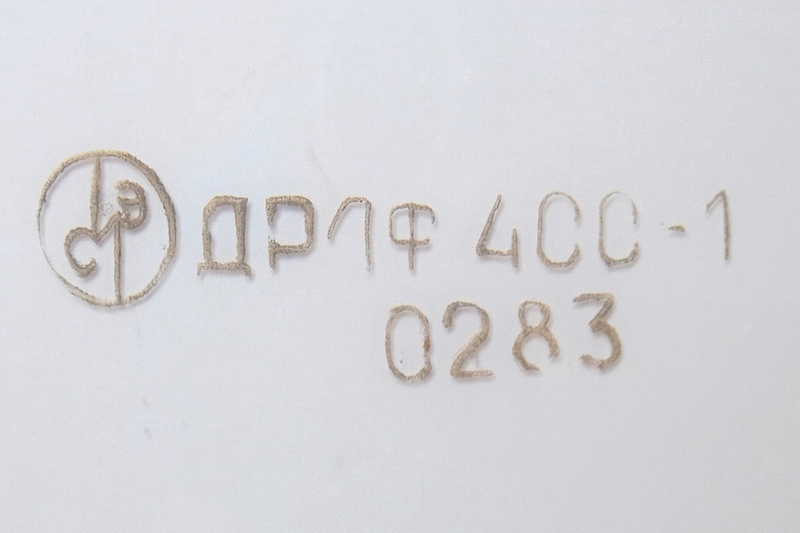 References: 1) SELZ DRLF400-1 lamp of Alexander from 1983-Feb on the Virtual Museum of Electric Lighting (Russian). 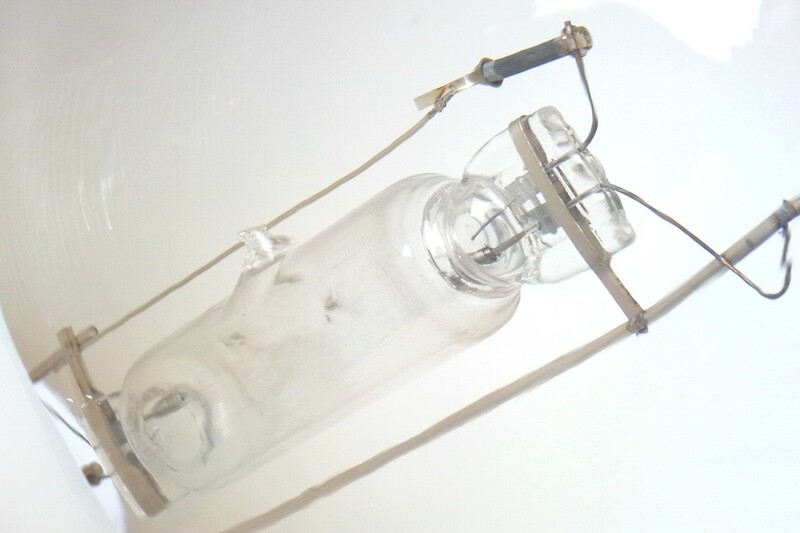 2) SELZ DRLF400-1 lamp of Dr. Cortex from 1984-Q1 on the Virtual Museum of Electric Lighting (Russian).